International Journal of Research in Health Sciences,2018,6,2,21-24. Introduction: Iron Deficiency (ID) is the most prevalent nutritional disorder in the world. The prevalence of Iron Deficiency Anemia (IDA) is about 9% in toddlers, 9-11% in adolescent girls and less than 1% in teenage boys. IDA presents when there is not sufficient iron for haemoglobin synthesis. In particular it has negative effects on the behavior, cognitive performance, immune system and physical growth of infants, preschool and school age children. Material and Methods: Blood samples of 337 randomly selected children (6-59 months) visited to Pediatrics OP at GEMS Hospital , were taken in the study. Serum ferritin, Complete Blood Cell (CBC) and hematological indices were measured. Results: In this study (61.1%) of the children had serum ferritin less than 12mcg/dl. Prevalence of IDA were (29.1 %). The results showed that most children with IDA were at (12-23) months. Families with more than 6 children had (4.49) times greater chance of IDA. The mean of breast-feeding in non-IDA children was higher than IDA children (17.6 and 16.3 months respectively, P>0.05). In this study families who gave tea to their children for (1-11) months had the highest prevalence of IDA. Conclusion: There are several main risk factors for ID & IDA in the children. 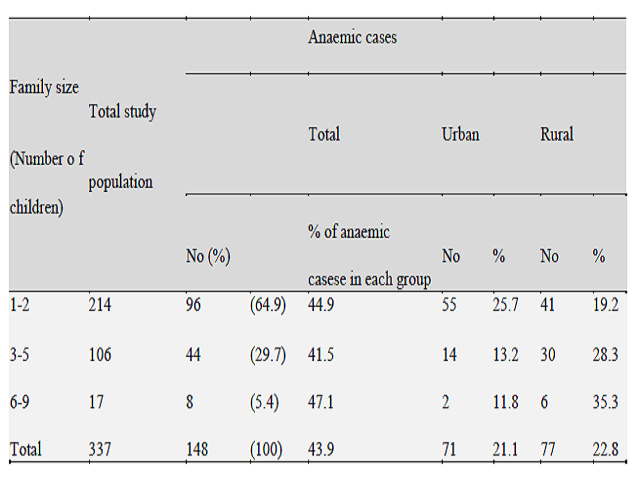 Parent's illiteracy, family income and using cow's milk before 12 months are among most important risk factors for iron deficiency for children. Distribution of anaemia according to the family size (number of children in each family).